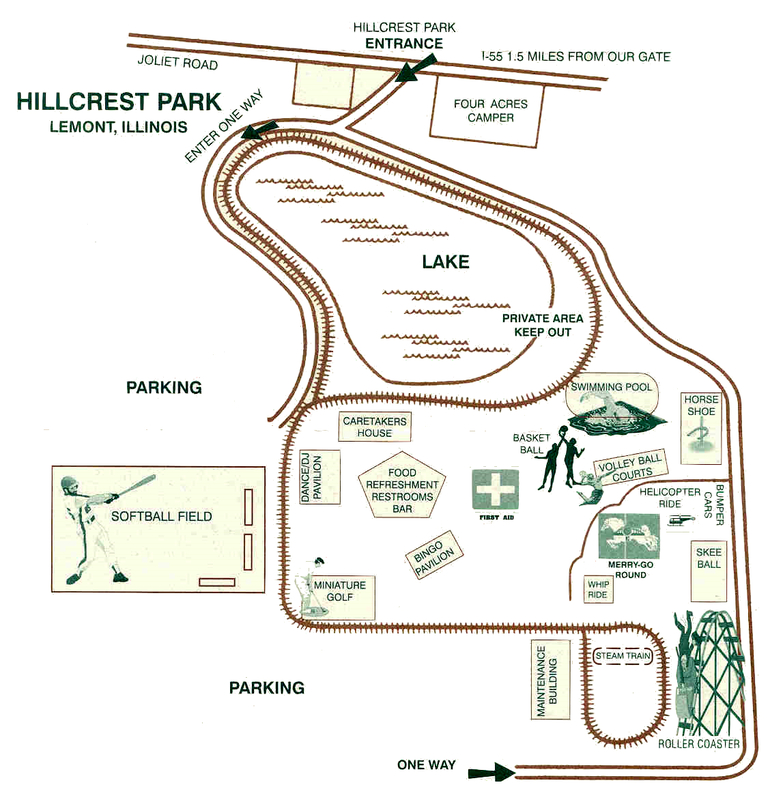 Hillcrest Amusement Park was located at 11335 South Joliet Road in Lemont, Illinois. A dark wooden sign marked the entrance to the park, easily missed if you`re not specifically looking for it. It sat on 60 secluded acres, so far back from view that most passersby didn't even know it existed. About 60 acres of the old Stuyvesant Peabody estate in Lemont was purchased in the early 1950s by 42 year old Richard Barrie. 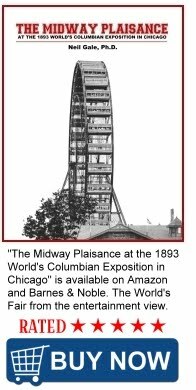 (who owned Storybook Park, pre-Adventureland, in Bloomingdale/Addison 1958-1961) Peabody had made his fortune in coal. The acreage Barrie purchased included a small lake. Starting in 1952, Hillcrest Park had been a full-service outdoor catering facility specializing in private picnics, primarily for corporations, promising a good time and non-stop food for all ages. Rain rarely cancels picnics because the park has an elaborate underground drainage system which helps eliminate standing water. There were plenty of shelters to avoid cancelling a picnic. Owners Richard Barrie and Wayne Kurchina, also 42, then later his son, Rick keep the entrance intentionally understated to avoid uninvited guests. 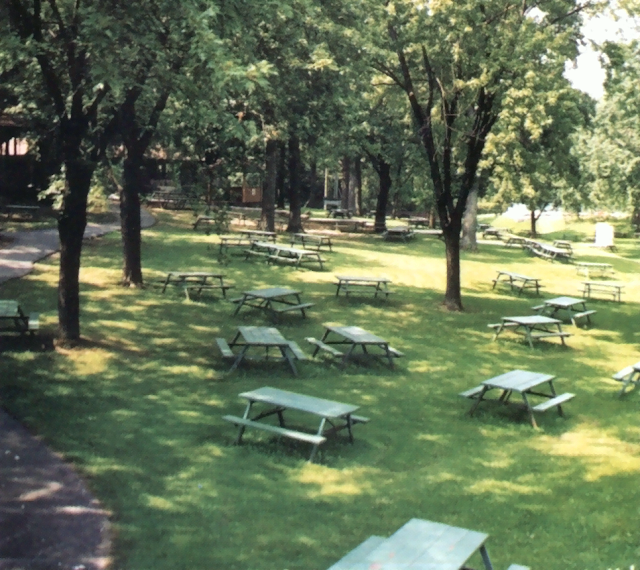 A winding, single-lane, paved road leads picnickers back to the grove, where parking lot attendants check invitations before indicating a spot to park. They immediately booked it full for their first season with either private or corporate parties. CLICK MAP FOR FULL SIZE VIEW. 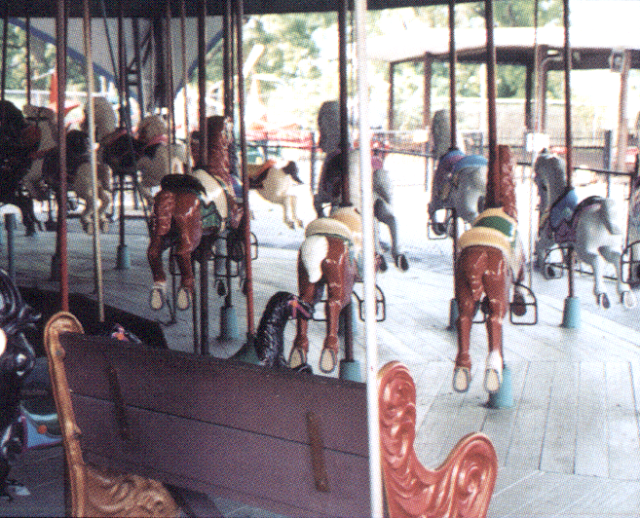 Rides included a Kiddie Whip, a Merry-Go-Round with 4 horses across instead of three (Note: near each of the Merry-Go-Round benches were two stationary horses about 1/4 scale of the regular horses for toddlers and little children), a Helicopter ride, and a Bumper Car ride with 16 cars. 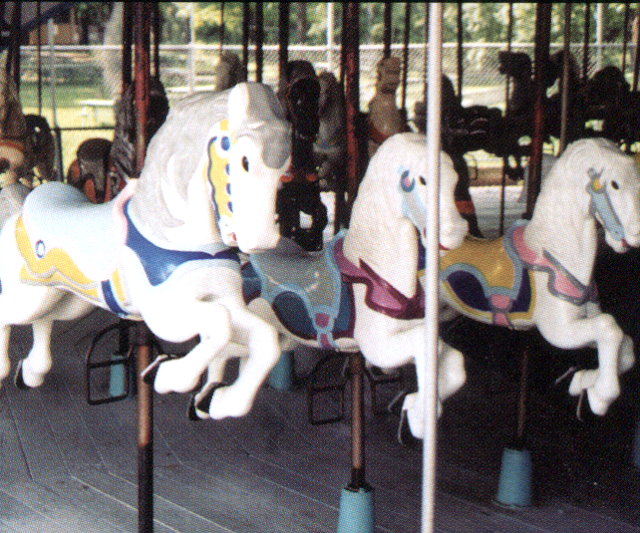 The park also had a miniature golf course, a shooting gallery, basketball and volleyball courts, softball diamonds, a swimming pool, a bingo pavilion, a dance pavilion and horseshoe courts. The authentic steam locomotive that beckoned eager picnic passengers was another ride from a bygone era. 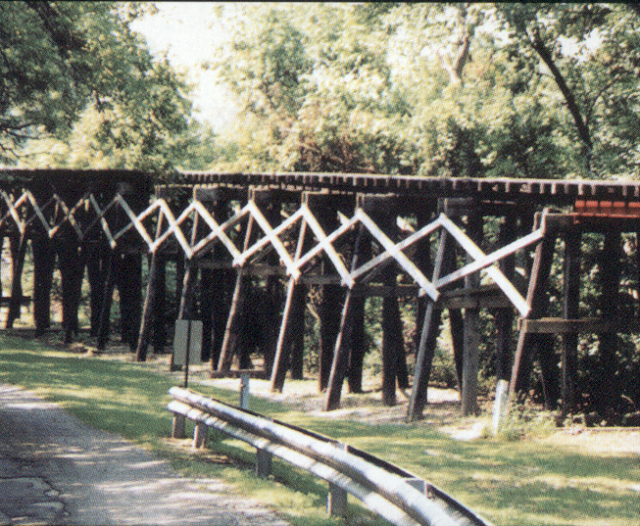 The steam engine required 300 to 400 pounds of coal for a full day of use. It took an hour to build up enough steam pressure in the boiler before it could pull the train. 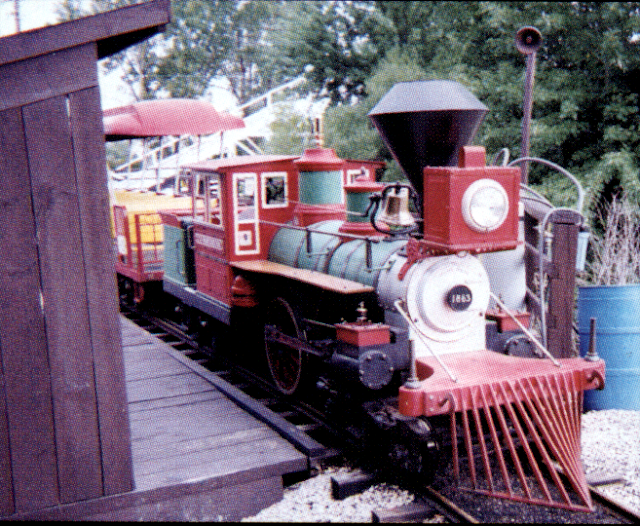 The train travels through the woods and around a lake. 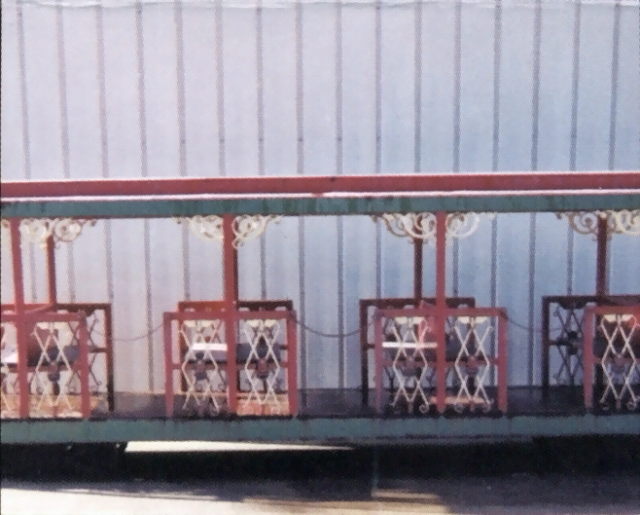 To keep the train ride lines short for large picnics, two trains were operated. The other train was a gasoline-powered locomotive. 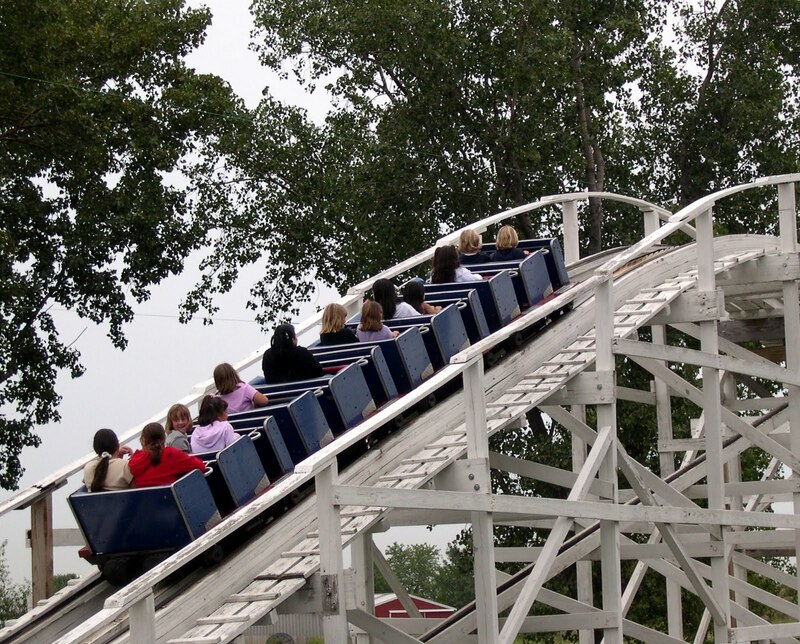 In 1967 the main attraction arrived at the park, the Little Dipper wooden roller coaster holding 16 riders. 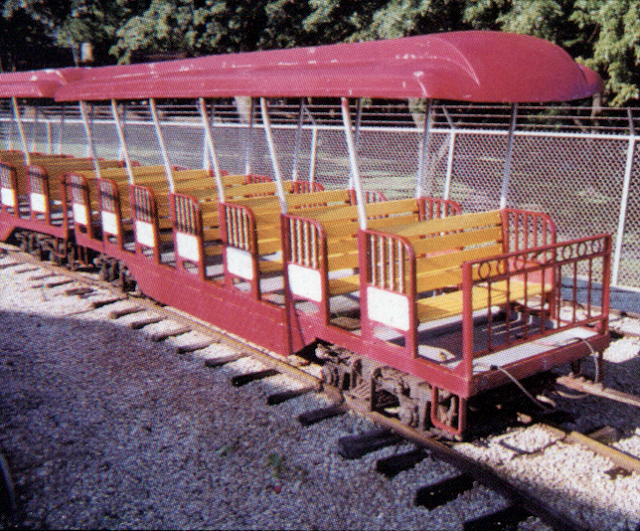 This jewel of a junior coaster was purchased when Kiddy Town at Harlem & Irving Park Road in Norridge, Illinois closed. 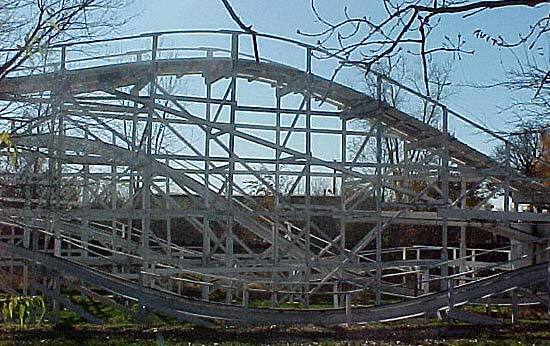 The wooden roller coaster at Hillcrest Park was called a "Junior Bobs" and was manufactured by the Philadelphia Toboggan Company. 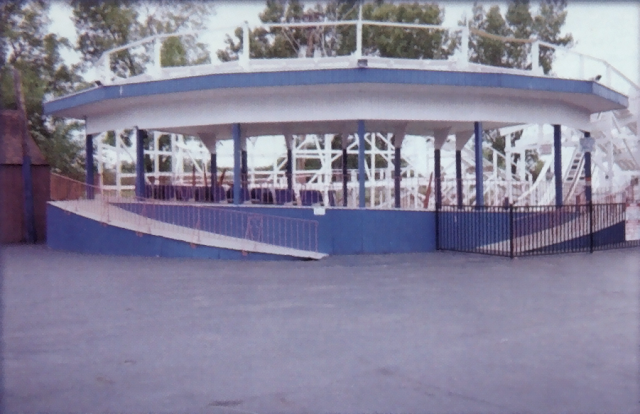 The Little Dipper was so unusual that there was only one other in the U.S., its sister was at Kiddieland in Melrose Park. 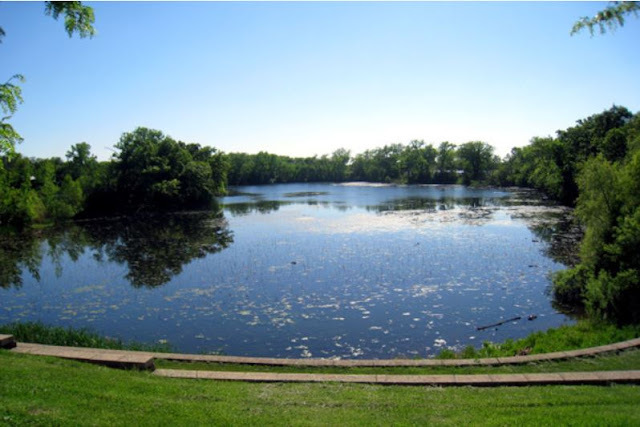 They had no idea how old it was when it was purchased for Hillcrest Park, but over the years they rebuilt it... twice. 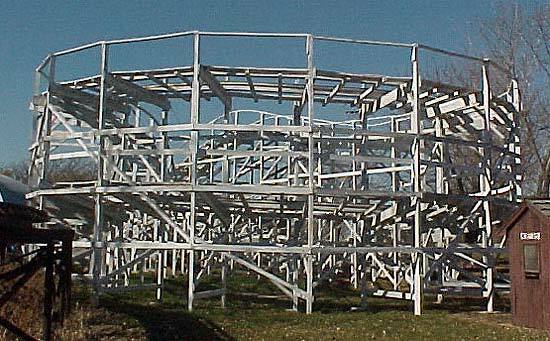 Entrance to the Little Dipper Wooden Roller Coaster. Exit from the Little Dipper Wooden Roller Coaster. 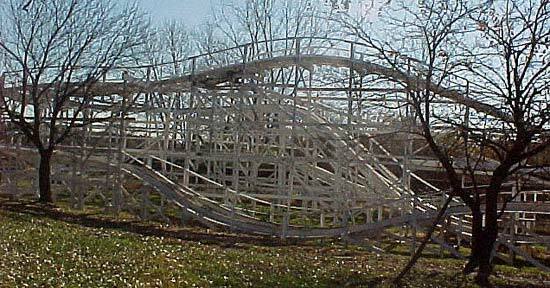 The Little Dipper Wooden Roller Coaster. 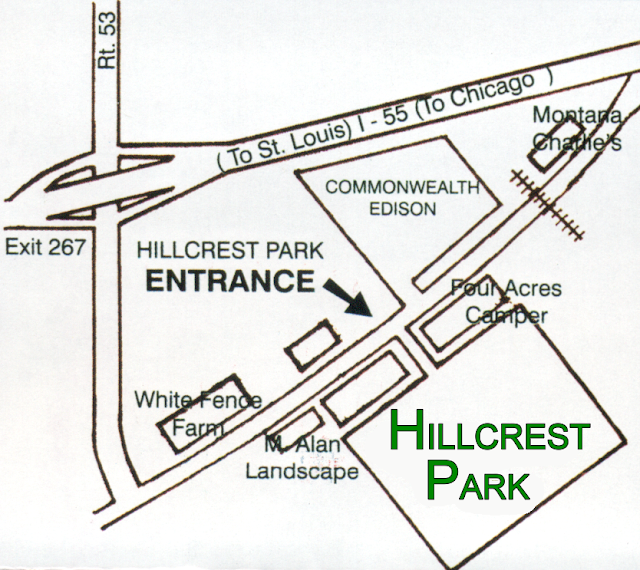 Hillcrest Park closed on September 1, 2003 after a decline in corporate picnics and an increase in the value of the land it sat upon. 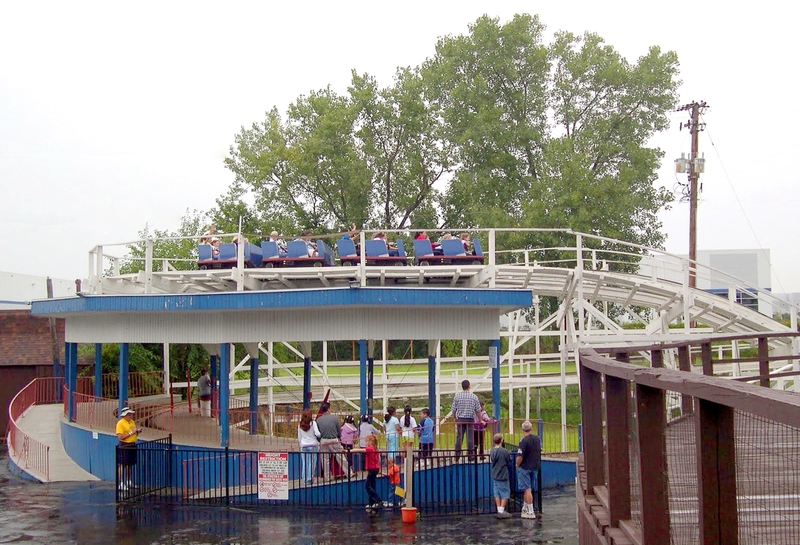 After the closure the rides, roller coaster and park equipment were auctioned off and the land was sold to a developer. 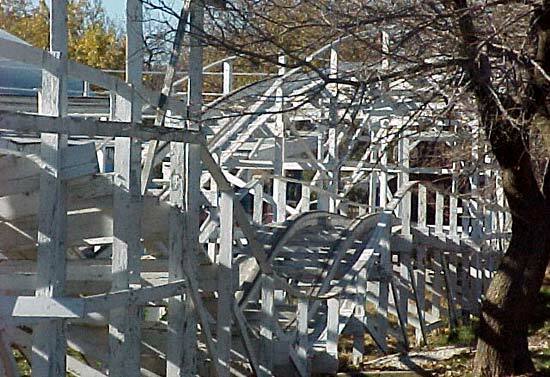 The Little Dipper wooden coaster was bought and moved to a small amusement park in Wisconsin called Little Amerricka Amusement Park (formerly Little A-Merrick-A) in Marshall, Wisconsin (owned by a family named Merrick). The Little Amerricka Amusement Park is still open. The "Little Dipper" was renamed the "Meteor" and operational for the 2007 season. 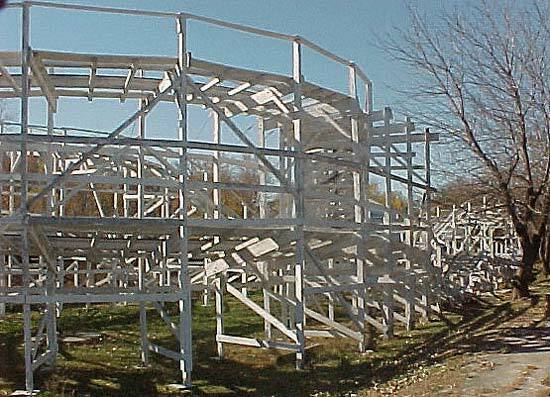 Take a ride on the "Little Dipper" roller coaster, now named the "Meteor" Little Amerricka Amusement Park in Marshall, Wisconsin. 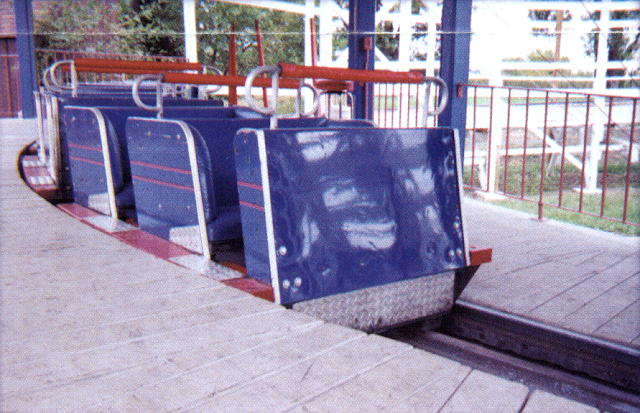 Ride the "Meteor" in first-person point of view. 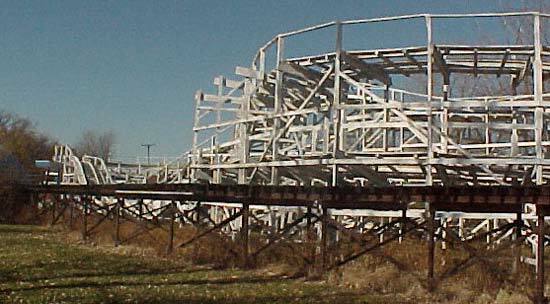 The "Little Dipper" Roller Coaster at Hillcrest Park. My husband and I met at Hillcrest Park. I was a paramedic tending the bandaids on boo-boos, bee stings and sprained ankles; he, a police officer walking the grounds with a officer partner, keeping the peace. The day of our wedding, we were allowed into the unoccupied park to take pictures. We have one of our entire wedding party sitting in the Little Dipper. I came to find, years later, that the company my father worked for for 40 years used to hold their summer picnics at Hillcrest Park. I guess that's why it seemed so familiar. 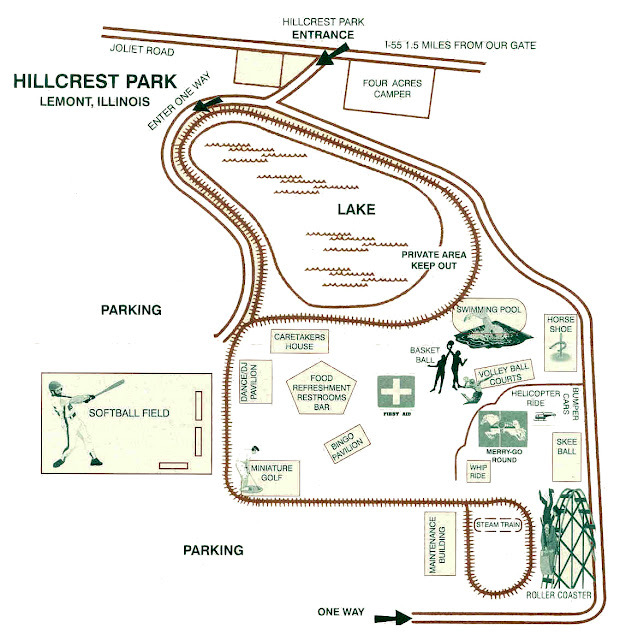 My heart and mind hold deep, warm and very fond memories of Hillcrest. We were sorry to see her go. Some great Union Oil Picnics there! My father’s company had a picnic there in 1973 or 1974. 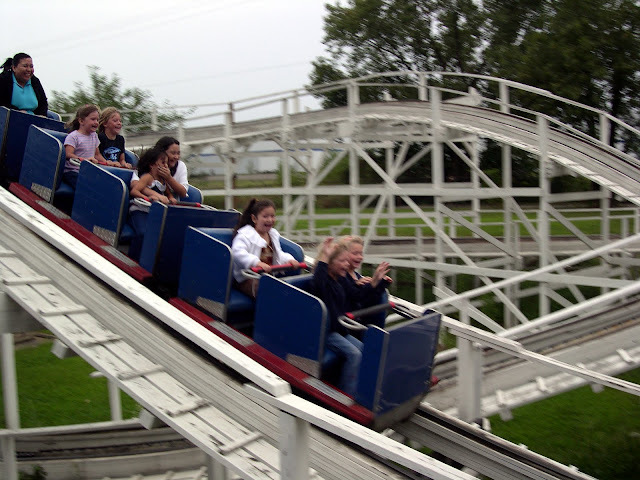 I remember that roller coaster. It was really cool sight. 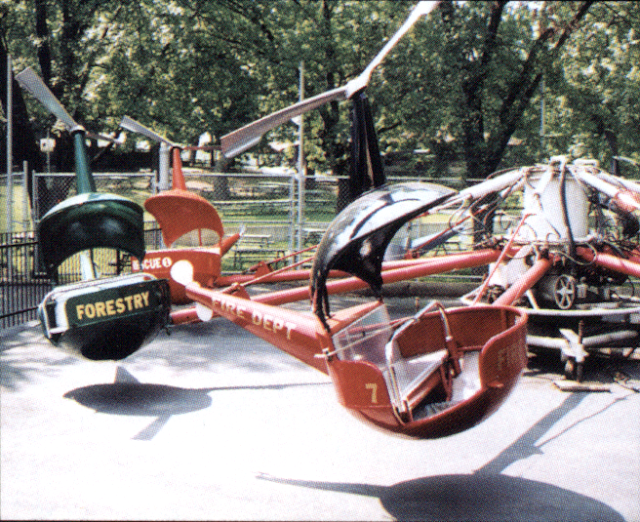 My Father's Company also had a Company Picnic there - I remember it very well, I even have a few photos somewhere!! I used to work there fulltime when I was 17-19ish. Cleaning during the week and getting the park ready for the weekend picnics. Then making food on the weekends. Depending on the size of the company, I remember making thousands of hotdogs. Christ Hospital was one of the largest. And they had a haunted house in the parking lot for a few years in the off season that I worked at too. Great memories. One year, before the last picnic of the season, all us kids who worked there, and all the people we invited (like 100 people) had a late night huge party without the bosses knowing. Got caught the next day because even tho we brought our own kegs we used 2 of the park's too and left one bag of garbage out. And the neighbors left messages about the music, noise, and rides going that elated. Can't believe that was 30 years ago. The company my mother worked for, General American Transportation Corp (GATX), used to have their company picnic at Hillcrest every year. I always looked forward to it. 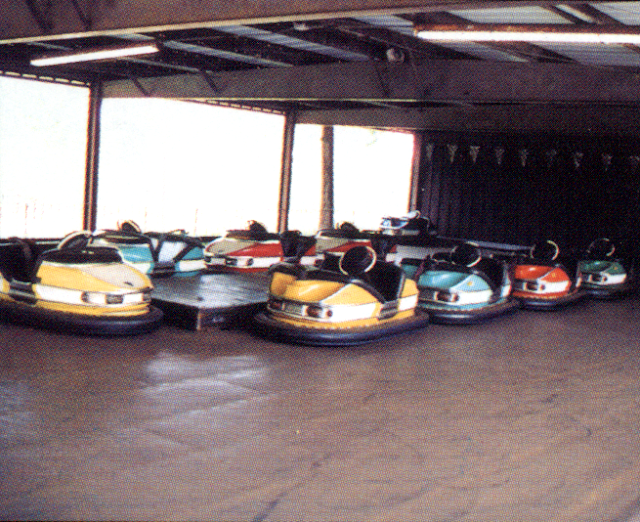 My favorite rides were the bumper cars and the live steam train. I loved the smell of the coal burning and I will always remember the sound of the whistle blowing through the meadow! I wonder what happened to that train?